School children carrying heavy schoolbags is not something new. But with the flawed education system (that's what I think) - rather than to just 'sufficiently' equip children at early age - these kids end up having to shoulder a lot of physical weight alongside mental pressure of being fed with too much information/knowledge too early. During our days, we had to walk for a couple of kilometres to school but lugging just half the weight that today's children have to carry. I can't recall seeing anyone at school having to bend to balance the weight on their backs. Late last year, India came out with an idea to "help tens of thousands of low-income students connect to the digital world" by introducing the cheapest tablet, the Aakash. Priced from US$35 to $45 (RM106 - RM137) with option to buy an upgraded $75 variant, this is one tablet that could be affordable to many Malaysian students. Will using tablets solve the heavy schoolbags? Like many others, I have a school-going child in a Chinese medium primary school and the burden she carries on a daily basis can be as heavy as 10kg - 12kg. That could constitute 20% to 25% of her body weight which is not healthy at all. To some extent I think the use of tablets/computers in schools could be a solution to ease the heavy burden of carrying textbooks. I must be quick to point out that there are several issues that need to be factored in if tablets are to be allowed in school, but that's beside the point and is for another discussion. 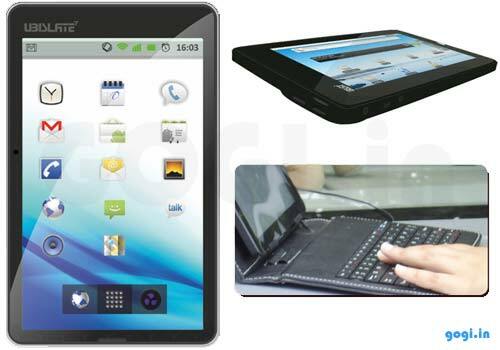 There are some tablets in the market that one can buy for less than US$100 such as the Velocity Micro Cruz, Maylong Universe M-250, Wonder Media, Ainol's Novo7, Pan Digital, Nextbook Android, etc. Surely, someone or some corporations can bring down the cost and patent a low-price tablet specifically for students. The shear volume will take care of the profitability issue when it is adopted by the relevant ministry. I agree with Mobile World magazine editor, Kasmhminder Singh's contention that instead of giving students RM100 each, as what happened during the recent government drive, it would be more useful over the long term to look into how tablets could become the new textbooks. Tablet could be locked so that it is not possible to install games easily, and it can go online to only authorised sites and networks. Compress the bulky text books into e-book versions like the apps in iPads and Tabs. Book publishers can still collect fee every year when the text books are loaded into the tablet. Jane E. Brody discussed this quite interestingly in her article, Heavy Backpacks Can Spell Chronic Back Pain for Children; give it a go, it's a good read. So, let's throng the electronic stores and grab one right now? It will happen sometime, perhaps in the near future. It is not a question of 'if' but rather 'when', so, while waiting for that to happen, do what can be done now. There are some good backpacks that will transfer perhaps two-thirds of the weight to the hips via a padded belt and good design. An example of this is the SPI ergonomic backpacks. Google to find out more about it. It is more expensive and not stylish or typically used by children in their early teens, but they are designed to reduce problems with carrying weight on the back. We bought one of these for our daughter. Within the next 10 years or so, many schools will start adopting the use of electronic school bags. I'm convinced. I have bought a RM500 tablet last week. Non-branded, but as useful as a branded one. i think they are on to something with they product!